What do you see when you look at this picture? It must seem self evident, two white dogs, walking side by side. Big deal? Do you know what I see, a magical moment! The White German Shepherd is Marcus, he’s a handsome love, confident with a beautiful nature. His little companion beside him is Sunny, who on the best of days is rather unsure of herself and timid. Sunny is the type of dog that when we go out for a walk will change her mind in an instance, if there is a loud bang, we encounter people or she gets a whiff of something in the air, she is shy and will bolt to go back home. When it comes to her reluctance to explore the neighbourhood, I work with it and respect that not every excursion is banner day for walking. Sunny and Marcus live in the same house hold, but I usually walk them separately as Marcus takes one step for every three of Sunny’s, I also have taken into consideration that she is older and reticent to get out and about and Marcus is very able and needs to work off some energy. Tuesday, after hearing that she and Marcus had gone out for their first stroll together with their Mom, I decided to try taking both dogs and give it a whirl. It went well, but we didn’t go far, baby steps sometimes is a prudent way to approach things. Today was pure magic! 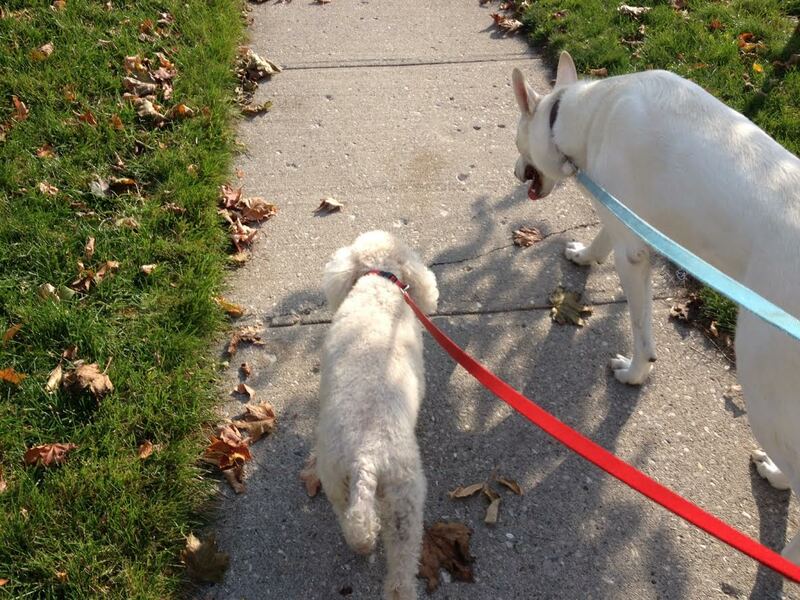 Sunny walked alongside Marcus without a care in the world. She was engaged and inquisitive. Normally if it is just Sunny and I, we go around the block, fifteen minutes if I am lucky! The three of us were out for an entire half hour today, and we explored a new park together! Marcus was happy, as he got to do a bit more sniffing and lifting of his leg, and Sunny pranced and looked about eagerly! It is amazing the impact one animal can have on another. The picture above is of a trans-formative moment, very cool!